There were preview parties last Friday in LA, the photos were FAB!!! Now with the full lookbooks out - I've narrowed my Lust list down. Well I tried to whittle it down!!! The long-sleeve cardigan, dress (below) and accessories are at the top of my list! 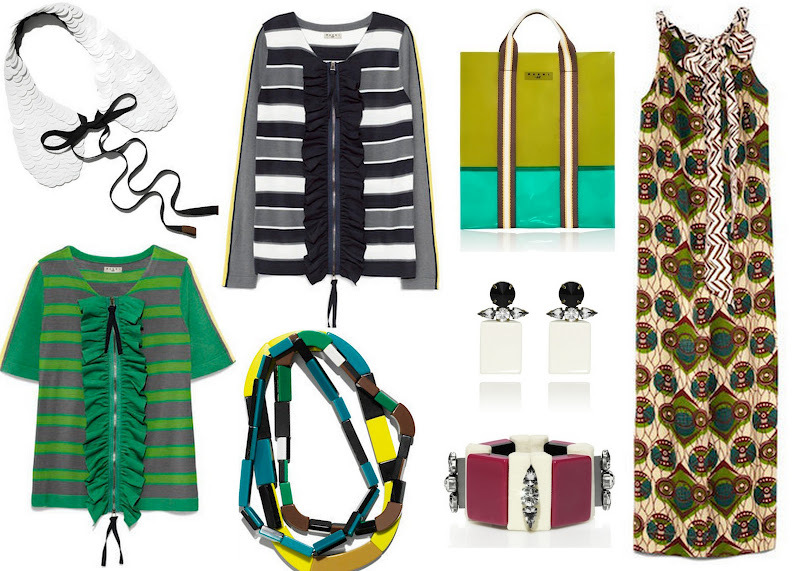 But really there were a bunch of items that I really like, so Marni and so my style! Anyone else as excited as I am for this????? And more importantly.... Do any Chicago Girls want to do it with me?!?!?! I'm not sure I want to do it alone again, but I really do want to go! Takers???? I am very excited !!!!! I'm loving the collar in white and in black. H&M needs to jump on the online shopping train already! I'm with you. I am VERY excited about this collection, and I don't usually get too worked up about these collaborations, but I love Marni, and what they've cooked up for H&M is EXACTLY my style, I want several of their pieces, but am I really going to battle it out with a bunch of 18 year olds? Good luck with your stakeout. I like following along with your tweets. They never have any of these collaborations in Milwaukee. I would totally go if I was in Chicago. I really like that ruffle top that you have in your collage. The accessories are fabulous! Can't wait! Great minds think alike! I so want a polka dot trench or suit! i really love the accessories and the polka dot coat. And the price point! love the bag + the jewelry! can't wait to see it all in person! the jewelry is so fab. i hope you go! I am loving those accessories! It would be fun to wait out all night! Good luck if you do it! I'm way down for this!! We can call each other so it feels like we are together! haha. omg - if only the nearest H&M wasn't 4 hours away! why, oh why, oh why!? that collar is awesome! I'm super excited for this collection -- so pretty! YES! Can't wait to get my hands on that dress! I'm so in love with all of this. Seriously freaking out about it!!! I wish I was in Chicago because I would totally go with you. I'd even pull a hair to get my hands on a dress! !